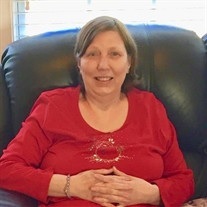 Brenda Sue Ayers, 62, of Chickamauga passed away Wednesday, August 8, 2018. She was born in Dade County, Ga. and had lived in the Rossville area for most of her life. She was of the Baptist faith and enjoyed helping with children, going bowling, riding her bicycle, listening to music and working on arts and crafts. She was preceded in death by her birth parents, Wallace and Lois Ayers; parents, Herschel and OraLee Ayers; and brother, Tony Ayers. She is survived by her brother, Eddie Ayers; sister and brother-in-law, Linda and Carlton Palmer; and numerous extended family and friends. Graveside services will be held at 1 p.m. on Saturday, Aug.11 in the Tennessee Georgia Memorial Park. The family will receive friends from 11 a.m.-12:30 p.m. on Saturday at the funeral home. In lieu of flowers the family has requested donations be made to the MaryEllen Locher Cancer Center, CHI Memorial Hospital Chattanooga, 605 Glenwood Drive Chattanooga, TN 3740. Online guest book at www.wilsonfuneralhome.com. Arrangements by W. L. Wilson & Sons Funeral Homes, Fort Oglethorpe.